In furtherance of its mission to nurture and renew America’s musical heritage, Copland House is very pleased to serve as a not-for-profit Fiscal Sponsor. In this capacity, we assist a select number of composers and performers working on projects involving the creation, performance, or preservation of American music. Our Fiscal Sponsorships are intended to help artists realize their goals! Since most funding is awarded to non-profit organizations, rather than to individuals, a Fiscal Sponsor (or conduit) can be an important vehicle to help encourage and stimulate donations for specified projects. As a Fiscal Sponsor, Copland House offers composers and performers the opportunity to apply to funders that limit their support to 501(c)3, tax-exempt organizations. In this role, we will accept contributions restricted for the selected project; provide financial oversight to ensure that these monies are used properly and as intended; and offer administrative and clerical support in processing, acknowledging, and reporting on donated funds. Copland House’s Board of Trustees determines which projects are accepted for sponsorship. Each Copland House Fiscal Sponsorship is governed by a formal, written agreement that details all respective responsibilities, and enumerates the terms of this financial and legal relationship. Copland House assesses a modest administrative fee on all funds received for sponsored projects. What is the exact nature of the proposed project and its planned activities? What are the goals of the planned project? What is the prospective timetable for the project? What is the estimated project budget? From which sources is it anticipated that funds will be raised? Provide examples of other successfully-executed projects. Should Copland House wish to consider sponsoring a project, we will then ask for more detailed information and work samples. We are eager to hear about project plans, and to explore ways that we may be able to assist in realizing them. Golden Motors is a full-length music theatre piece set in 1980s Detroit. At the heart of the drama, a tight-knit African-American family clings to its lifelong dreams, even as the city's auto industry collapses. 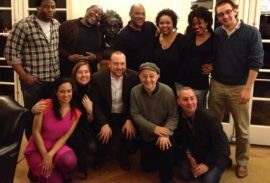 Long-time collaborators Wendy S. Walters (book and lyrics) and Derek Bermel (music), seen here with their cast and creative team, relate a compelling original story about the challenges facing a working-class family amidst the city's declining economy. This is a uniquely American tale of love and despair, violence and reconciliation, inaction and heroism in an era of swiftly changing rules and expectations. Tracing one family's challenges to reclaim what remains of their future, Golden Motors has continued relevance and resonance in today's world.